Welcome to my stop on the Remix blog tour hosted by Walker Books Australia. 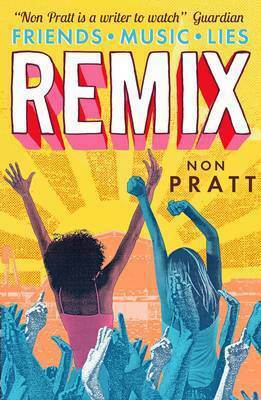 To celebrate the release of Remix by Non Pratt, I’m lucky enough to share with you all a guest post by Non featuring some of her favourite Aussie YA novels. Also, be sure to read to the end of this post to read my review for Remix! Guest Post by Non Pratt! It’s only one of the most glaringly obvious choices she could possibly have made, I hear you say, but the thing is… one of the finest YA books ever written is yet to be published in the UK. I had to buy my copy in New York. The way I describe reading Jellicoe Road is that it feels like falling in love: confusing, yet compelling to start with, until you find yourself completely immersed and incapable of thinking about anything else. The interplay between present-day narrative is the best I’ve ever read and like everyone ever, I fell hard for Jonah Griggs. When I talk about it to UK readers, I describe it as the best book they’ve never read… but you guys are way ahead of us on this! There are writers, and there are writers – Lanagan is definitely the latter. The way she wields language it’s as if the magic altering the fabric of her fictional worlds is altering the one in which you’re reading the book. Her characters are cruel and innocent and complex, the worlds in which they live so vivid you feel fear and hope and dread as if you’re the one it’s happening to. Liga’s story is packed with violence and tragedy… but there is nothing so cruel as hope. Tender Morsels boggled my mind and broke my heart. Raw Blue feels less like reading a book, so much as inhabiting another person’s life. Carly’s daily routine of working in the kitchen by night so she can surf by day, is fascinating – managing to be both depressing and uplifting as she slowly reveals the terrible journey that’s led her here. Every word feels real, every character, every situation. Plus major bonus points for describing a surfing in such a way that made me feel like I was the one out in the water, when I’ve barely even stepped into the sea beyond my knees. Bit of a dodgy inclusion on this list, because I wouldn’t necessarily class Nix as YA any more than I would Harry Potter, but let’s not split hairs, because I never get to talk about my love for Lirael. I read Sabriel when I arrived in New Zealand on a gap year after university. I liked it a lot – enough to fork out for a copy of the second book in the series, which I loved. Sabriel went on a traditional adventure – a physical journey into the unknown – whereas Lirael (at least to start off with) was taking a different type of adventure, one more similar to a reader like me, and I loved exploring her world, her library as she tested her boundaries and discovered herself. And then, of course, there is the Disreputable Dog, who is probably the second-best* animal companion to exist in fiction. *Pantalaimon is number one – if you can count daemons as animal companions! Thank you so much Non for sharing your picks! Keep reading to read my review for Remix! Kaz is still reeling from being dumped by the love of her life... Ruby is bored of hearing about it. Time to change the record. Three days. Two best mates. One music festival. Zero chance of everything working out. Kaz and Ruby have been best friends forever. Their relationship has withstood boyfriends, breakups and the complications of high school. But can their friendship survive three days at a music festival? Remix is a beautifully written story of best friends, boys and bands. Remix tells the story of two friends with seemingly nothing in common. Kaz is a good student who shares a close bond with her mother and is trying to survive a broken heart. Her best friend Ruby is in danger of being held back a year, her parents don’t understand her and all she wants to do is catch the eye of her favourite rock star. But their friendship has held strong throughout everything. When they both attend the Remix music festival along with Ruby’s older brother Lee, his boyfriend Owen and a collection of other assorted friends, their relationship is tested in ways they never considered. Is a lifetime of history enough to overcome the difference directions their lives are headed? This is a book I didn’t want to put down. I loved how Non Pratt relayed to us the story of Kaz and Ruby’s antics. The point of view switches every chapter to give the readers a well rounded view of just what went down at Remix. The relationships in Remix are delightfully authentic – this is one of those books which can make you forget you are reading fiction because the issues the characters face and how they come across as people is so realistic. Kaz and Ruby are two friends who love and support each other but they don’t always agree with each other’s actions. Their behaviour at times isn’t entirely ethical or moral. But personally I liked this about them because they aren’t perfect people. Kaz and Ruby both do somewhat desperate things in the heat of the moment and have to live with the consequences. These mistakes might make you question them as people but make the characters that much more realistic because of their flaws. Their ex-boyfriends make an appearance with the two leading ladies handling their situations in very different ways – with both feeling completely right for each of in terms of their characters. There is both romance and love-gone-wrong in Remix and I loved reading about the highs and lows of Kaz and Ruby’s love lives. The pacing in Remix is perfect for the story. Whilst the events may take place over only three days, there is enough backstory to make the reader feel as if they truly know these characters and can understand their actions at the festival. The pop-culture references throughout the novel are great to read as is the festival vibe. The secondary cast of characters are wonderful. They add to Ruby and Kaz’s story whilst at the same time feeling like they have their own lives and drama going on. Remix has been one of my favourite reads of 2015. The friendship between Kaz and Ruby was brilliant to read as they navigate the highs and lows whilst at a music festival. Many thanks to Walker Books Australia for the review copy. Such great selections from Non! And I totally agree with you about the pacing! I wasn’t sure three days would be enough narrative time to tell the story because the characters’ relationships were in such a state of flux but it worked so well!